I think most of us would agree that music history is an area that is difficult to cover thoroughly during private lessons. Music camps, however, are the perfect opportunity to get submerged in music history and learn a lot in just a few days! As I was planning for this camp, I wanted to find a way to teach the information I wanted to cover in a way that would NOT be dry and boring…with me just lecturing or spouting off a bunch of facts to remember. :) I wanted it to be fun and creative, and most of all, memorable. My end goal was to have my students be able to give a reasonable guess of what time period a piece of music was composed — even if they are hearing it for the first time. In my search, somewhere on the internet I stumbled across something called “lapbooking.” I had never heard of it before, but I was very intrigued. 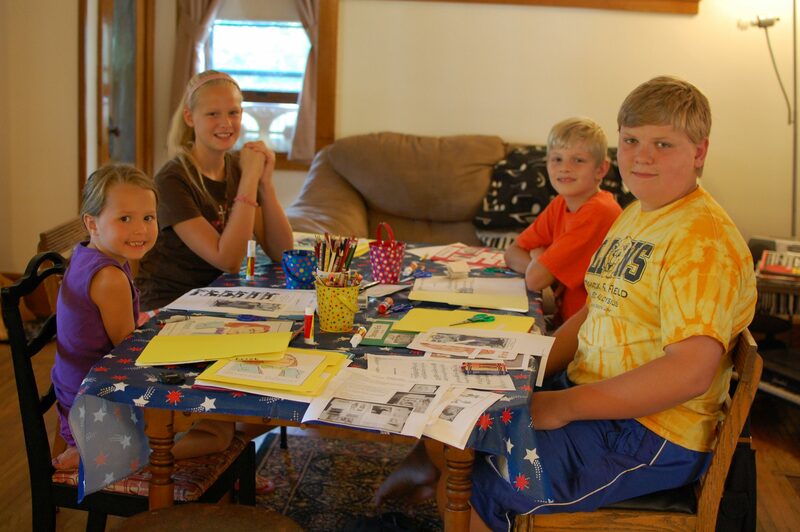 Lapbooking is something that homeschoolers often use as a creative way to study a particular topic. Basically, you take a file folder and glue in “minibooks” of different shapes and sizes that explain different facts within the topic. Lapbooks are difficult to describe in words — so take a quick peek at this Flikr group for lapbook pictures. When I saw what lapbooking was, I decided it was perfect for my music history camp! We spent about a half hour each day on a time period. We discussed the architecture, the art, the fashion, and most importantly, the music of each period! We also discussed the evolution of the harpsichord to the modern piano. The booklet you see in the large pocket is a biography I wrote about the composer. I did find a few sites online with free composer biographies for kids, but in my opinion they seemed either too fictional or included facts that were unimportant/uninteresting for kids. So, I decided to write my own. :) We read through the biography together, and then assembled the lapbook. Students took home their composer lapbooks at the end of each day, and took home the Periods of Music History lapbook at the end of the week. On the last day of camp, we also held a fun little guessing game! Beforehand, I created a playlist in YouTube of pieces from the time periods we studied. When I played each piece, each student had an opportunity to guess what time period the piece was from and to give a supportive reason for their answer. I tried to choose clear examples (the most obvious ones were played on the harpsichord or have Alberti bass), but a few of them were tricky! I was very pleased with how effective the lapbooking was. 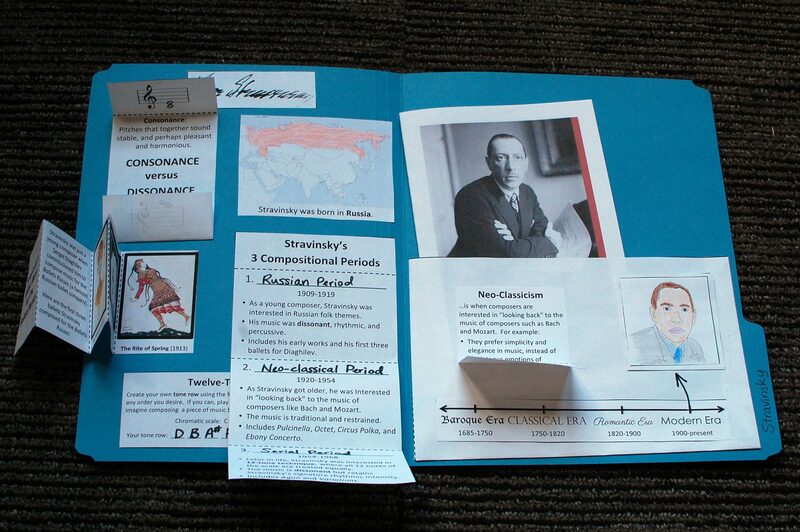 Before the students left each day, I quizzed them on the facts from the biography to see how much they remembered. They did very well! They liked comparing the different composers, too. For example, they noticed how young Mozart was when he died (35) compared to Stravinsky (88). Download the the Periods of Music History lapbook materials here on the blog for FREE, or purchase the individual composer lapbooks in the Color In My Piano shop. March 2013 Update: To view a free lesson plan for using the lapbooks for a 4-day camp, view this post. Thanks so much, Heidi! Can you share the links to the post you mentioned? Wow, how creative. Thanks for sharing the ideas and I look forward to the rest. Thanks for the wonderful Music History lapbook I will be using with my son as we homeschool this year just curious do you have anything or can you recommend anything similar for music history pre Baroque Era? Thanks again! Hi Crystal! 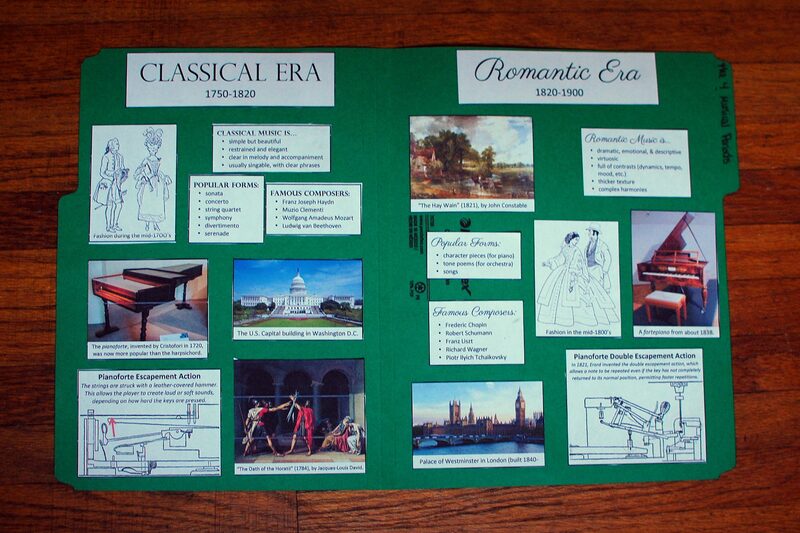 Sorry, I don’t currently have anything for pre-Baroque Era. Maybe this is something I’ll do in the future. We’ll see! This is fabulous; so creative, and “hands on.” Looks like great fun! By any chance, can you fill in the gaps? By listing the pieces and composers here, or updating the playlist. Thanks again for all your wonderful resources!